Found 38 file extension associations related to Calibre for Linux and 1 file format developed specifically for use with Calibre for Linux. Calibre can convert from a huge number of formats to a huge number of formats. 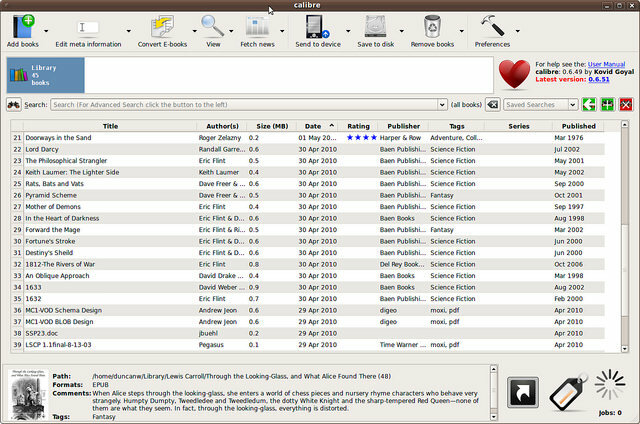 It supports all the major e-book formats, such as ePUB, MOBI, FB2 etc. Calibre has a modular device driver design that makes adding support for different e-reader devices easy. Calibre can automatically fetch news from websites or RSS feeds, format the news into a ebook and upload to a connected device. The ebooks include the full versions of the articles, not just the summaries. If you need more information please contact the developers of Calibre for Linux (Kovid Goyal), or check out their product website.